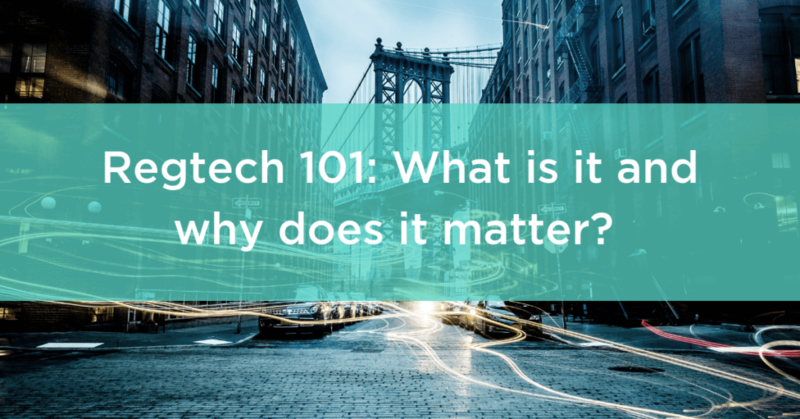 Perhaps you’ve heard the term “RegTech” and you’re not sure where it fits in with FinTech? For starters, RegTech is short for “Regulatory Technology” and was coined almost four years ago in the U.K. Since then, it’s become popularized in the U.S. and sprung new technologies that help banks, financial institutions, and government agencies meet regulatory demands for reporting, monitoring, and managing compliance risks — all while saving those entities lots of time and money. Regulators are also optimistic about RegTech. In the U.K., RegTech has benefited for years from the Financial Conduct Authority’s (FCA) RegTech “sandbox,” which allows businesses to test products, services, business models, and delivery mechanisms in the real market, with real consumers. In the U.S., the Commodity Futures Trading Commission (CFTC) has initiated the LabCFTC program to promote RegTech innovations that can benefit the American public. Regulatory bodies are also highly interested in RegTech’s growth to better utilize their scarce oversight and enforcement resources. Speakers from the Consumer Financial Protection Bureau (CFPB), the Federal Reserve, and leaders in financial services will also come together at the “RegTech Enable” convention in Washington D.C. to shed light on how this technology can help simplify and automate the compliance needs of the industry. As is the case for all companies pursuing true digital transformation, more financial institutions are partnering with startups that offer nimble and customizable technology in the form of identity management, big data and analytics, AI and machine learning, blockchain applications, and cloud services. First, firms in the U.S. and U.K. have scrambled to find solutions to keep up with increasing regulation and compliance. RegTech has emerged as a lifeline to help firms ease this burden and streamline labor-intensive and costly tasks. Second, legacy IT systems quickly become outdated and are difficult and expensive to modify. Company executives are realizing it’s friendlier on their bottom lines to implement the help of specialized third-party solutions, rather than painstakingly recruit and onboard new talent to build proprietary technology from scratch. Third, RegTech solutions are aimed at making it easier and cheaper for financial institutions to comply with ever-changing regulations, without requiring manual processes that drive up errors, time, and headcount. The financial services industry is an immediate beneficiary, given the complex, multi-layered (international, federal, state, and local governments) regulatory environments it faces. RegTech is also helping new financial institutions such as MSBs, and payments industry leaders such as Intuit, Alipay, Airbnb, and Amazon. These entities have different needs than those banks and other traditional financial services institutions. API-driven, these tech-savvy companies naturally need more automation for their digital products in order to scale and grow their customer base. And, not only do new FinTech businesses share an innovation ethos, but they can also integrate new technologies quickly because they don’t have the burdens of legacy systems. Know Your Customer (KYC) and anti-money laundering (AML) solutions make up the bulk of RegTech firms and funding. Beyond these two concentrations, other offerings target compliance management and fraud detection (Kount), identity verification services (Jumio), and machine intelligence and big data analytics (Ayasdi). RegTech companies and startups have swiftly popped up over the past five years. The bulk is focused on compliance in the financial services sector. Just in the first half of 2018, RegTech companies raised $2.5 billion in funding across 74 deals. In early 2018, 80% of RegTech deals involved North American firms. And for the past five years, American companies have outpaced RegTech funding across the globe. RegTech 2.0: Where do we go from here? More institutions will be focused on RegTech solutions to manage compliance and regulatory requirements. However, as the sector matures, its transformative potential lies in its ability to go beyond mining data insights, by utilizing machine learning to support complex business decisions and drive greater profitability.